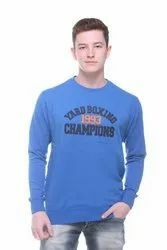 Manufacturer of a wide range of products which include men round neck sweatshirt. Show off your casual side with this high-quality Sweatshirt by Harbor N Bay zip-up.Has a Henley neck, long sleeves, button closure and Beautiful chest Pocket.Designed in regular-fit using fleece fabric, this sweat jacket is comfortable to wear all day long. Add this fashion-forward Harbor N Bay zip-up to your casual wardrobe staples and stay warm all year long.Made from Fleece Fabric.stylish Chest Embroidery. Wear this Black classic Sweatshirt with dark wash jeans for a casual lunch outfit.